Because of that it’s difficult to criticise Bowe … it feels wrong, and even more so when he collected a serious injury during the Argentinian game. 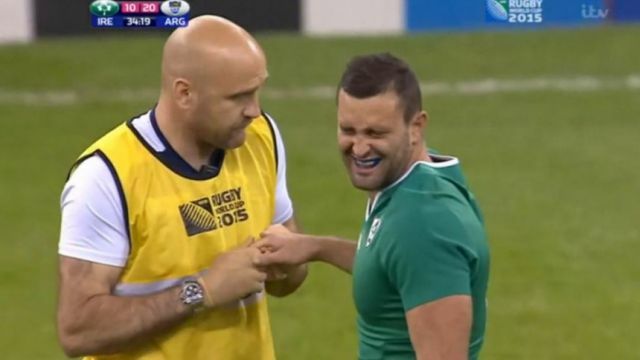 As a consequence of his likability and his record, you always give Bowe the benefit of the doubt, but I thought his selection against France, like that of Cian Healy, was Schmidt making a call that form was temporary but class was permanent. There was a great line break to set up a chance for Keith Earls but there wasn’t as much incisiveness as was hoped for from a Lions test winger for the last two tours. What is incision, given that it’s our longest running tag? It’s a combination of angle, strength and pace. Angle is about the rugby intellect – be it instinctive, experienced or drilled – but strength and pace are purely physical attributes. Wing is a position that more than any other requires pace and when it dips then the fall in performance can be quite severe. Tommy Bowe dots down accurately for Ireland’s first try against Romania. The Ulsterman will miss the entire Six Nations for the third time in four years, and is in a race against time to be available for the summer tour to South Africa. At 31 years old and with 67 caps to his name, the parallels with another outsize winger of recent vintage are striking but hopefully not fateful: Shane Horgan earned the last of his 65 caps at 31 years old in the November 2009 test match against Fiji. There was some light hearted joshing from Chris Henry towards his Ulster team-mate about his advancing years in the build-up to the Romania game, but it’s a long road back from knee-surgery, and while your minutes on the pitch grind to a halt, old father time doesn’t stop for anybody. Bowe has had an extremely unlucky run of injuries over the last number of years: a serious knee injury in December 2012 that precluded his participation in the 2013 Six Nations, a broken wrist suffered on Lions duty in the summer of 2013 that kept him out until November of that year; a long-running groin injury which ultimately ruled him out of the 2014 Six Nations, and now another serious knee injury that will very likely ensure he plays no part in the 2016 Six Nations. He turns 32 years early in the new year, but as Indiana Jones once said, it’s not the age, it’s the mileage. Luke Fitzgerald: Finally made a world cup having won his first cap in 2006, only to start in one game and that at first centre against Canada because of an injury to Rob Henshaw. Fitzgerald was Ireland’s best player against Argentina once he was on the pitch, scoring one try when he’d a lot of work to do and setting up the other with a midfield break and a peach of an offload to the supporting Jordi Murphy. Perhaps even more Keith Earls, versatility is a curse for Luke Fitzgerald and he hasn’t helped himself. Both players have ‘gone public’ at various stages on their desire to play a different position other than the one they were currently being picked in. Earls gave a relatively notorious interview a number of years ago to the Irish Examiner, where he was quoted as saying that he “absolutely hate[d] playing 11”, and the grass has always been greener for Luke in positions other than winger; first it was fullback, in the last couple of years it has been centre. Fitzgerald looked like he had to raise a bit of a gallop to get over the line for his try against Ireland, but he took the chance well and then made the next one to boot. His performances in the World Cup were very positive – albeit limited – and bode well for a positive impact on the 2016 Six Nations. I thought his desire to play fullback in 2012 was misguided, and I don’t really buy him as an outside centre at test level; I think his distribution skills aren’t up to it. His most recent outing in the No13 jersey [against Wales in the Lansdowne Road warm-up] saw a particularly noticeable case of outside-centre-as-inside-winger: he had possession 13 times, and only passed once. However – and as evidenced against Canada in Ireland’s first pool game – I think he could be an effective first centre in a similar fashion to Gordon D’Arcy. He’s also still a very good left wing, as he showed against Scotland in the last game of the Six Nations and when coming on for Bowe against Argentina in the quarter-final. Whatever he decides on, he should stick to it and aim for one more World Cup where he starts in his best position. His finger was grand, they were showing a replay of Argentina’s first try on the big screen behind the doc. Badum-tish! Poor Dave. He had a great August and September and played his way on to the plane and into the team. He wasn’t the only player to underperform against Argentina, but you’re exposed as a winger and can really take a licking on a bad day. The Mole remembers Stefan Terblanche running four tries past Denis Hickie [and breaking his face for good measure] back in 1998. That was a far worse personal performance, and Hickie eventually came back from it a better player and went on to have a smashing test career. Dave Kearney: If the Irish rugby team was a reality TV show then Dave Kearney would be voted off the island quite early. While everyone loves Tommy Bowe, no one seems to rate Dave Kearney. He’s good in the air, he breaks the line and he rarely gives the ball away. Kearney beat more defenders in the tournament than any other Irish player: 11 to the 9 each chalked off by Earls, Zebo and Henshaw. Isn’t that what practically every rugby critic in the northern hemisphere has been asking for in the aftermath of the quarter-finals? Elusiveness over brute force, running for daylight instead of into a brick wall? You can see why Schmidt is a fan but public sentiment is against him, e.g. “Daverage” etc. He got stood up against Argentina and his wing leaked tries throughout the game. Not all of them were his fault, but he was done like a kipper for the first, and so early in a big game that it’ll stick in the collective memory for a long time. It was clear that he hadn’t developed any sort of rapport with Earls and Ireland’s defence was ransacked by an on-form Pumas team for whom “every bounce went [their] way”. Simon Zebo: The Mole felt a little bit sorry for Zebo during the tournament and didn’t really understand his selection. He’s started four matches for Munster at full back over the last two years in the league and four matches for Ireland in the same position in under two months. If Schmidt had wanted a second full back then why not pick Felix Jones? Having selected Jones regularly in his match-day squads over the 2014-15 season, it must have been a tight call for the coach. Zebo never got a start on the wing, which I think is his best position, so never got a chance to press for a place in the starting team. His performance against Romania was a showcase of what he can do with ball in hand against a naive defense, but he wasn’t able to follow that up with a similar showing against Italy the following week; that was disappointing, given his influential role against the same opponents in this year’s Six Nations. The Schmidt-Zebo dynamic just doesn’t sit right and I can’t put my finger on it. I think Schmidt feels a duty of care to all his players and wants the best for them, but he wants them to achieve their best his way … so even though he picks the likes of Cave and Zebo, he’ll drop them sooner than others as they’re just not his style. Zebo is the most Bowe-esque winger in Ireland in terms of height, aerial ability, finishing and the ability to pull something out of the bag, so while Schmidt favourite Andrew Trimble is back in harness and might be the favourite to get the nod for the Six Nations, there’d be a strong argument for the Munster man. Rob Kearney: One of the elder statesmen of the team who had a solid tournament, scoring an important try against France and playing, to paraphrase Edmund van Esbeck, in a “most accomplished” manner. The two most likely candidates to challenge Kearney at full back were both playing in the centre so he had a fairly free run at the role. Kearney comes across as a blue chip individual, mature and measured, and you can imagine him moving into a significant business role at some point after rugby; his current role as IRUPA Chairman shows that he is held in high esteem by his peers, and he’s a key part of the leadership group. Unlike some others in the squad he has specialised at one position and is very assured there, although not quite at the level of Ben Smith and Leigh Halfpenny. There’s a bit of a chicken-and-egg scenario two of the most decorated players in the squad, Kearney and Heaslip: has early specialisation been that important to their career progression, or have they nailed down those positions purely because of their talent? Kearney Snr. [not the dad, the older of the two brothers] has never been a convincing tackler; he’s extremely good in the air and a direct runner but not a great distributor. He is one of those players that is best appreciated when he is not there as his absence creates an air of uncertainty in the back three. This is the crux of the matter for Irish rugby as far as developing back play to the next level. Brian O’Driscoll had that same instinct as Cullen and Tommy Bowe also picked a good line. That sort of attacking rugby is a collective endeavour, a two way street that requires the player with the ball to look for support and furthermore, to create space in order to be really effective. Even the way the national conversation discusses offloading reveals how we think of attacking with ball in hand. An offload, as far as I’m aware, is a pass out of an attempted tackle so we’re looking for contact before we decide to pass. While that’s a valuable skill, it’s only the lesser part of the equation. The real skill is using the tackler’s necessity to follow the ball carrier in order to manipulate the defence then passing before contact in order to stay in support. Check out the Try from the End of the World, how many of those passes are “offloads”? French rugby has mislaid that mindset but the style remains the most mesmerising, enjoyable and effective rugby available. IT’S MESMERIC! Christian Cullen wasn’t waiting for the tackler to dictate when he got the ball, he imposed himself on the defence. Check out this highlight reel and see how Cullen gets onto the shoulder of the ball carrier and also into the space between two defenders. This has been part of the lexicon in the US for more than half a century, Vince Lombardi’s footballing philosophy was best captured in a book called “Run to Daylight”, published in 1963. It’s not about just “offloads” its about cutting a line and being hungry for the run. Also, it’s important to emphasise that Wallace diagnosed a lack of nous as the main reason that his team mates couldn’t fully exploit Cullen’s ability – not ball skills or pace but awareness. We often beat ourselves up about improving ball skills after these tournaments but its awareness that is the biggest obstacle towards developing a more potent attacking game. In fact, to emphasise the point, offloading out of the tackle to someone who isn’t cutting a line means that the defence is probably put on the front foot. The real work is done off the ball before the contact. If you can bring yourself to watch it, go to Murray Kinsella’s excellent (and much referred to) piece about Ireland’s defensive horror show and check out Hernandez’s supporting line off Cordero’s shoulder for the first try. He doesn’t get the ball but the threat that he might is enough to cause confusion in the defence and create space wider out. That’s the sort of play Irish rugby needs to develop in order to progress, not offloading just for the sake of it but passing to a positive, attacking line. Run to Daylight! For the record, I’d have picked Murray-Madigan-Earls-Fitzgerald-Henshaw-Kearney-Kearney for the match against Argentina. There was an argument for picking Zebo or Bowe ahead of Earls based on better fielding but given that Earls was marking Cordero that shouldn’t have been as much of an issue. This entry was posted in Mole's World Cup Diary and tagged Dave Kearney, joie de vivre, Luke Fitzgerald, Rob Kearney, Simon Zebo, Tommy Bowe by dementedmole. Bookmark the permalink. 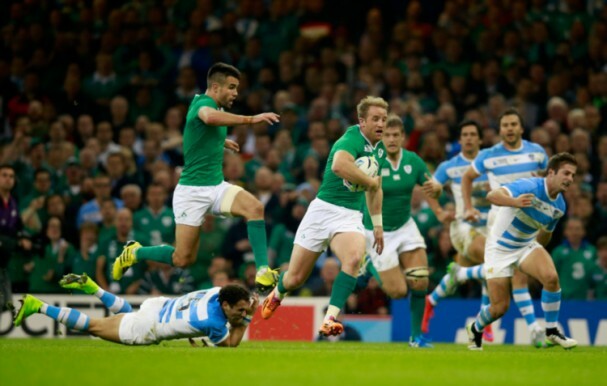 The evaluation of Rob Kearney’s performance and value are very perceptive Mole. Rob is missed when we don’t have him plus, opponents don’t “bomb” us with high balls, when he plays. But, his missed touch from inside his 22m with the score still 0-0 in the QF was a key mistake, but not his first of that sort. Rob doesn’t find support often when he carries the ball from deep, unlike Nacewa, his Leinster team-mate and resident full-back. This is largely mind-set, not skill, and reflects the occasional nickname of “securicor” which he acquired at a fairly early age from some Leinster supporters. I agree with a lot of what you say and emphasise that “the two most likely candidates to challenge Kearney at full back were both playing in the centre so he had a fairly free run at the role.” My issue isn’t just that Kearney plays as described, its that Irish rugby has produced few alternatives. In https://dementedmole.com/2015/09/22/wrestling-romania/, I wanted to see a Henshaw-Cave combo in the centre with Payne at full back. Allowing for a difference of opinion about Luke Fitz – I’d have him at first centre and you’d have him at second – just one injury to the midfield exposes how few resources Ireland have at the moment. That changes if and when McCloskey/Olding/Ringrose/Arnold develop to international standard but that’s another level to where they’re at now. Thanks, Mole. Great work as always. Dave Kearney needs a speed coach. You can beat a man or getting passed into space but when you’re that slow the tries are hard to make happen. This is the problem with Dave Kearney. He simply doesn’t have pace and, at the highest level, it shows. That quote from Wallace could be used to describe Casey Laulala’s time at Munster. Would love to see Murray & Marmion as our 9s, Sexton & Jackson as our 10s, Madagan, or Olding at 12, Henshaw at 13, Fitz at 11, Earls or Trimble at 14 and Payne or Zebo at 15 for the 6 nations. Great stuff as always but I missed parts 4 and 5. Are they available? Dog ate parts 4 and 5. Coming soon. That was ruff! Keep ’em coming. Yep same. Parts 4 and 5 appear to be missing? Good stuff as always Mole but Luke Fitzgerald’s distribution isn’t good enough for 13 but you’d try him at 12 as a Darcy like conversion? Surely distribution at 12 second 5/8th and all that has to be as good as 10 and 13? Am looking forward to part 5 verdict on 12 & 13s as we are still in the post Darcy/BOD transition period. Not yet convinced about Henshaw as a 12 (distribution etc) but I see you referenced McCloskey/Olding/Ringrose/Arnold as the coming men at centre, Has young Brewer’s star faded completely? Thought his hands were v good when I saw him play but his pace could be his problem at the top leve? He didn’t make the 2015JWC having gone in 2014 but maybe that was down to injuries during the season? He is in the Leinster academy so they will presumably give him and the other candidates a chance to fill the Darcy-shaped hole in Leinster at present. Perceptive question JB. I believe Luke Fitz is better when he’s less time to think so second centre and full back don’t suit him as much as first centre and wing. He’s got great feet and he’s a very good tackler so he’d get going forward at 12 and be solid in defence. Brewer is playing for Terenure in Div 1, haven’t seen B&I teams for this weekend but he might be at that level if going well in academy. It’s hard to tell how anyone will do stepping up a level until they’ve played a game there, let’s hope he goes well. He was a very good at offloads out of the tackle at underage level.